Should you go in for a Hair Transplant or Hair Replacement? If you have severe hair loss and patches of baldness on your head, then I am sure you are considering going in for a treatment of some sort to cover up the bald patches. Among the options you have are hair transplant and hair replacement. Both can bring about a change in your hairline and hair volume, to varying degrees. We tell you here about the procedures so that you can pick whether you want to go in for hair transplant or hair replacement. In most cases, hair loss and baldness comes with your genes. Alongside, it can also be caused by aging, poor circulation of blood, lack of nutrition and environmental factors. If your hair loss set in early in your life, then the chances of baldness are higher. Hair transplant is a surgery wherein small pieces of scalp and hair from healthy parts of your scalp are relocated to the bald areas. The procedure involves punching out grafts of the scalp in different sizes and shapes. The grafts can be mini-grafts, micro-grafts, strip grafts or slit grafts. These offer you a considerable increase in the volume of your hair. If you are looking for a more substantial increase, then there are methods called flaps and tissue expansion that are used. Hair transplant is a full blown surgery that uses a local anesthetic. Strips of healthy scalp are removed and relocated into incisions made in the bald patches of your scalp. If the baldness is extensive, you would need about 2-3 sittings and a period extending a year to observe healthy hair growth in the new grafts. If you have genetic baldness wherein the top of your head starts balding while you have healthy hair on the sides, then hair transplant is for you to consider. This is because, hair transplant needs healthy donor scalp. Hair transplant costs more than hair replacement. Depending on the extent of baldness and the technique used, a hair transplant surgery can cost you anywhere between $4000 to $15000. Hair replacement is a is a non surgical method for those who want a dramatic change in their hair and do not have enough healthy donor grafts in their scalp. The procedure makes use of synthetic or human hair and is not invasive. A hair replacement is nothing but a lightweight wig that is made with synthetic or human hair and helps cover your bald patch. They are either attached by a glue or by a weaving process or by clips. 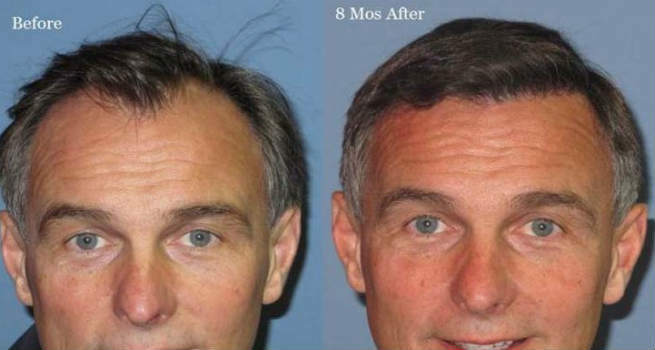 If you do not have enough hair for the grafting process or if you want to completely stay away from any kind of surgery, then hair replacement is the option for you. Hair replacement gives you a wide variety of options when it comes to the extent of coverage and the styling of hair. A skin bonded hair replacement can cost you anywhere between $600 to $1200, depending on the quality and the area it covers. These are a far evolved version of your artificial looking conventional wigs and can help you attain natural looking hair at a fraction of the cost of hair transplant and without any pain too! So here we saw two options to get back your lustrous mane. You can choose one of the options depending on your budget and preference.